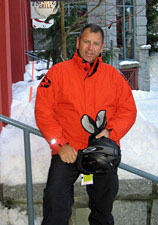 Powderhounds.com is a ski and snowboard travel website that provides information and reviews for those researching their next snow holiday or vacation. The aim of our website is to share our experiences with you in the hope that it will help your pursuit of the perfect powder stash! 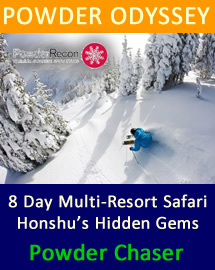 We review ski resorts, cat skiing and heli skiing in many destinations around the world. We also provide information and reviews on tours, activities and accommodation. 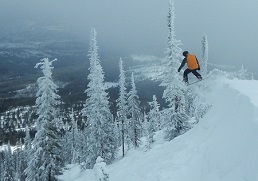 Powderhounds.com can help you with booking your next snow trip. We can provide advice on the most suitable destination for your needs, and we work in partnership with travel agents and a multitude of tour operators who can help you with your booking and additional advice. In some locations, we also provide you with the option to book accommodation directly. 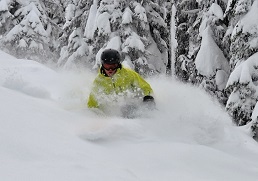 There are no additional costs associated with booking via Powderhounds.com. We are a group of ski and snowboard enthusiasts who have travelled the world in search of the best powder stash. We are definitely not pro-skiers/riders or even awesome skiers/riders, but we've visited 200+ ski destinations, so we feel we're in a good position to compare the differences between many ski resorts, cat skiing, heli skiing and tour operators. Occasionally we'll review restaurants but we lay no claim to being expert foodies! When we provide information and reviews we don't glorify or embellish things. We tell it how we experienced it. Greg is a skier who grew tried of the not-so-secret stashes at Mt Hotham. He is a legend of the après and an expert at making snowballs. He has been skiing for over 30 years and hopes he has another 40 in him - too many places to explore and not enough time! Greg is the Top Dog of Powderhounds.com. You're only as old as the women you feel (I mean ski with). The camera man always gets to go first on a powder day; just to capture everyone else skiing down of course! Lushie is the Leader of the Pack and Chief Editor of Powderhounds.com. Her ridiculous hallmark used to be her pink Barbie helmet, and she's now replaced it with an equally childish headpiece. 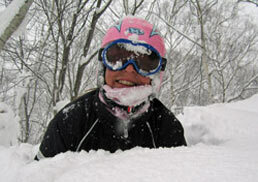 She hopes that by wearing a kids’ helmet she’ll retain youthful knees to enable powder skiing into her 70s. She also loves the matching pink powderhound paw prints on her Wagner Custom skis, not to mention the way they ski. Cat skiing is her idea of the purrrrfect powder skiing pursuit, although she’s really not that fussy about how she gets her score of fresh powder. Chris heads up Powderhounds Europe. 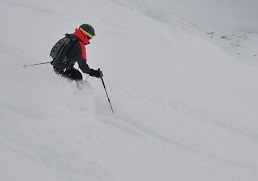 He's travelled to a lot of places but his most frightening ski experience was skiing near Glencoe in Scotland (yep, Scotland) - bulletproof glacial ‘snow’, force 10 Arctic winds, white out conditions , unmarked cliffs……..you get the picture. While powder in Scotland might be rare, everywhere is good (or bad) on its day. Chris' mission is to search out all the good days in Europe and also the best places to be when its bad! Ski resorts: Monterosa Ski, Italy; Skicircus Saalbach, Austria; Dolomites, Italy. Beer: anything brewed by ‘Leffe’, all Belgian beers and microbrews from the USA. Have developed a taste for Hefeweizen. Mmmmmm......beer! ‘That grinding sound in your knees is perfectly natural"
‘The first sign of fear is turning". Skiing powder, filming friends skiing powder, hiking/skinning out of remote hills after skiing powder, drinking good beer when finished skiing powder. Wendy is one of those skiers that is still in love with her old gear and cries often (nightly) at their passing e.g. her old fluoro poles and her Rossignol Bandit XLs. One day she’ll get over their demise. Her poles broke at Lake Tahoe and her skis just couldn’t function anymore from overuse! Wendy will suffer happily on her new fat skis and spread her smiles and perfect ski style across the world, but if anyone has a good pair of ladies 160cm Bandit XLs gathering dust, please donate them to Wendy. She will forever be in your debt. Equipment: Rossignol JC skis and Line Celebrity 100 skis, Dimar-Fritschi AT bindings, Scarpa boots. Overseas ski hills for powder: Snowbird & Solitude (Utah USA), Asahidake (Japan), Vail (Colorado USA), Monterosa Ski, Courmayeur in Italy. Drink: Aperol Spritz, Holgate Winter Ale, Idaho Springs Nut Brown Ale, Murphys Double Chocolate Stout. Loves: Skiing powder with like minded people, which is even more satisfying if an effort has been made to get to it. Disappointing ski moment: When friends finally realised that on powder days my regular offer to 'go first to take photographs of them' was not a selfless act of kindness! Afflictions – suffers greatly from FOMO (Fear of Missing Out), so will always come along for just one more run even when dog tired. Brett is the king of optimism and thinks every day of snowboarding is the best day ever!